The chart below shows pricing tiers for a 1-year Membership. Significant discounts are available for multiyear Memberships. **Membership for audience sizes under 400 are also available. Contact us for more information. How many tools do I have access to? As a Member, you always have unlimited access to our growing Libraries of more than 4,000 pieces of engaging, effective content – from videos and cartoons to articles, case studies and training presentations. Does Membership include access to new tools and content? Yes. Our multimedia Library is always growing and continuously updated with new content curated by subject-matter experts. Feel free to contact us any time with your content needs and feedback. Once you become a Member, we provide instant access and a free, facilitated on-boarding session that helps you launch an effective compliance communication program right away. Membership includes unlimited, ongoing support by your named member engagement manager with no additional fees or charges. What if I need only one type of tool, or coverage of one topic? Isolated pieces of content simply aren’t effective – both in terms of driving change and keeping up with your company’s evolving needs. That’s why Compliance Wave offers comprehensive compliance training and communications solutions that use repetition, pattern interruption and other principles based on behavior change-science to align your learners. Our solution allows your program to evolve, expanding to cover new topics as they arise. Compliance Wave makes it easy to adopt other modes of communication and engagement, all with no additional fees, change orders or administrative effort. How is this different from the training program I’m already doing? To drive lasting change, you need more than one-time training sessions – you need a communication strategy that engages and educates your employees. With Compliance Wave, you’ll see how easy it is to create multiple channels of compliance content that keep vital issues at the forefront on a daily basis. Are translations available for the content in the Libraries? 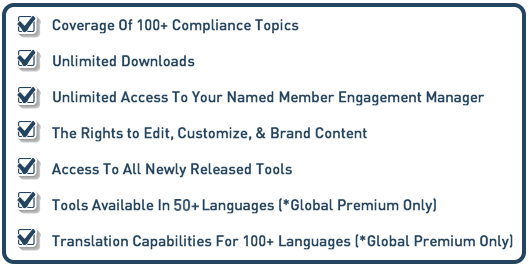 A Global Premium Membership helps your compliance team communicate throughout the world, with content in English and over 35 other languages. Additional translation services are available for 100+ languages. Do I need to have a learning management system (LMS)? No. With Compliance Wave’s user friendly tools, you’re able to start sharing content right away. You don’t need special software, lots of help from your IT department or complex training. At the same time, our tools are compatible with any LMS, e-learning or content delivery system you may have. We offer tools and features for nearly every learning style: from cartoons and articles to case studies and training modules. Our multimedia Libraries help you communicate at regular intervals with compliance content that’s short, engaging and entertaining. Can I customize or edit the content? Absolutely. Every organization has unique compliance needs, so we make each of our 3,000 pieces of content yours to completely customize or edit, and completely free of any Compliance Wave branding. Adjust for tone. Adjust for policy nuances. Add your branding, visuals and specific workplace examples. Our tools exist to help you make your communication program outstanding. In addition to videos, what other tools are available in the Libraries? We offer tools and features for nearly every learning style: from cartoons and articles to case studies and training modules. Our multimedia Library helps you communicate at regular intervals with compliance content that’s short, engaging and entertaining. Contact a Compliance Wave Communication Specialist Today! NO, my company likes boring communication.